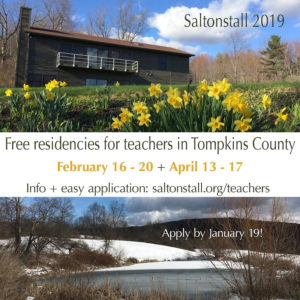 Saltonstall | Calling all Tompkins County public school teachers! Calling all Tompkins County public school teachers! Did you know Saltonstall has two upcoming FREE 4 night, 5 day residences for teachers? Your stay includes private one-bedroom suites, private studios for visual artists, chef-prepared dinners each night, miles of hiking trails, and hours of quiet, uninterrupted time in which to work. You may be thinking, “But.. Is this for me?“ If you are a teacher, working in a public school in Tompkins County than this is for you. This is not a juried residency. It is open to artists and writers of all stripes. Are you a chemistry teacher with a passion for writing or photography? An art teacher who longs for time to devote to their own work? A math teacher who is secretly working on a memoir? YES, this is for YOU! Space is limited and based on lottery. Apply here! Applications are due by 11:59pm this Saturday, January 19.